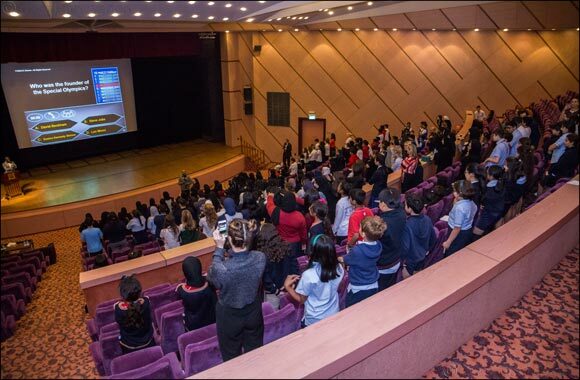 UAE, 12 February 2019: Over 600 local pupils from 35 schools in Abu Dhabi have participated in a workshop to learn more about the Special Olympics movement and its values of inclusion and tolerance. The local schoolchildren have been elected as ‘Unified Champions’ by their teachers and will head back to their respective schools to spread the message of the movement and encourage their fellow pupils to be more inclusive. As part of their role as Unified Champions the schoolchildren will act as ‘Champions of Change’ and encourage other pupils to get involved in and support Special Olympics World Games Abu Dhabi 2019. The workshop was held in partnership with the Ministry of Community Development at the Armed Forces Officers Club in Abu Dhabi. The Unified Champions will help lead on the Adopt a Nation program, which was launched last year ahead of Special Olympics IX MENA Games 2018. Adopt a Nation is an interactive program that sees schools partner with national Special Olympics team around the world and personally interact with team players. Each participating school adopts a competing nation to study, which culminates in them inviting Special Olympics athletes from across the world to their schools during the Host Town Program (8 – 11 March). The programme aims to leave a lasting legacy of diversity and inclusion in local schools, whilst also providing thousands of enthusiastic fans to cheer on the 7,500 athletes coming to compete. Tala Al Ramahi, Chief Strategy Officer at Special Olympics World Games Abu Dhabi 2019, said: “Unified Champions are incredibly important in helping us to spread our messages of tolerance and unity to the next generation and in ensuring we create a more positive future for People of Determination across the nation. Programs such as Adopt a Nation and Fans in the Stands will enrich the lives of young people across the UAE. Implementing the Special Olympics values into students’ education, especially at an early age will ensure that the youth of today are the drivers of change and spread the message of inclusion. The first ever World Games to be held in the Middle East and North Africa, Special Olympics World Games Abu Dhabi 2019 will be the most unified Games in the 50-year history of the Special Olympics movement, with inclusion of People of Determination in every aspect of the event.